Click here for audio of Episode 1858. Today, we just miss fame. The University of Houston's College of Engineering presents this series about the machines that make our civilization run, and the people whose ingenuity created them. 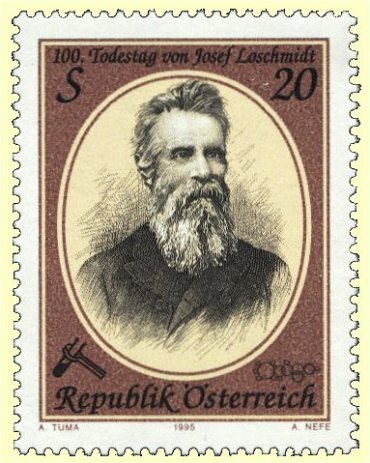 Josef Loschmidt was born into a poor Bohemian peasant family in 1821. With the help of a village priest and the Catholic Church he managed to gain an education in science. He worked for a while in the new chemical process industry where he invented a way to produce nitrate. Then that process turned out to have been known fifty years earlier. That was an odd hint of things to come. He soon published a book on chemistry in which he discussed benzene, a compound that'd baffled people. They couldn't see how the atoms were arranged. It was he who first saw they had to form a ring. But his description of how the atoms linked to each other was incorrect. Soon after, chemist Friedrich Kekulé got it right, and Loschmidt's contribution was pretty much forgotten. The great puzzles of the mid nineteenth century drew Loschmidt in — questions like "How big is a molecule?" Ask yourself how you'd answer that one — obviously not with a ruler. Loschmidt realized he could deduce the size of molecules from two kinds of information. One was a relation connecting the size of gas molecules to the distance they travel between collisions. The other was the packed volume of molecules in a cold liquid. He correctly found that a small molecule is around one nanometer in size. And that led him to put flesh and blood on another idea. The Italian, Romano Amadeo Carlo Avogadro, had suggested that all gases have the same number of molecules in a given volume. Loschmidt figured out how many molecules that would be. His number was high but then, we're still honing it. Some people argue that we should call the number of molecules per gram-mole The Loschmidt number instead of Avogadro's Number. This is not really a priority debate. After all, we know exactly what each person contributed. Still, it's Avogadro whom we remember. Loschmidt contributed to Maxwell's and Boltzman's work on thermodynamics. His electromagnetic studies now bear the names of people who completed them — like Hertz and Hall. When Loschmidt died in 1895, Boltzmann wrote, "His work forms a mighty cornerstone that will be visible as long as science exists." Boltzmann was right about the cornerstone part. But not the visibility. Few of us who've used Avogadro's Number have even heard of Loschmidt. Yet, while the message seems to be that life isn't fair, this is not a sad story by any means. Loschmidt was clearly more interested in science as a process than as a way to become famous. By the way, he married for the first time at the age of 66, to his housekeeper. Soon after, his only child was born. W. Böhm, Loschmidt, Johann Joseph. Dictionary of Scientific Biography (C.C. Gilespie, ed.). New York: Charles Scribner's Sons, 1970-1980. Vol. ? ?, pp. 507-511. I am most grateful to WSHU listener James W. Cooper for calling my attention to Loschmidt. The Engines of Our Ingenuity is Copyright © 1988-2003 by John H. Lienhard.